Do you ever do any stitching on your layouts? If not, you should try it. It is a trend in the scrapbooking world that adds dimension and depth to layouts, and it can be fun too! I ran across this beautiful layout where there is a lot of stitching going on. Don’t you love it? I do! It gave me an idea for a heritage layout that could be so much fun to create. I thought of the idea after watching the news this morning where they were talking about the art of quilting. While I don’t quilt or sew for that matter, I do have an admiration for the finished project. I can’t imagine how much time, detail, and love must go into a quilt project like that! But, since I know nothing about quilting and a lot about scrapbooking, let’s see how we can relate all this to a heritage scrapbook layout! Shall we? So, imagine creating a layout like the one linked above but instead of using paper circles that you stitch on, think about using scraps of fabric that you stitch on. But, instead of using just any old fabric that you might find cute, or interesting, try collecting some fabric over time that is meaningful to you. This is where the quilt concept comes in. 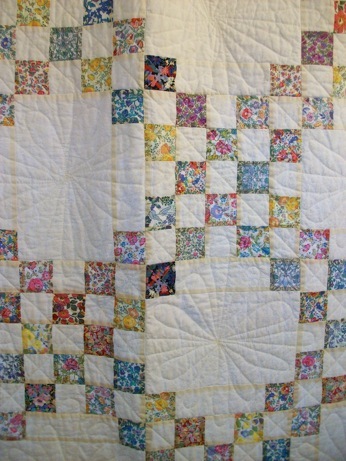 Quilts are often made from scraps of fabric that are meaningful in some way, all stitched together. What if you were to start saving scraps of fabric that are meaningful to your family history and create a layout of beautiful fabric pieces stitched on paper, instead of scraps of paper! So, let me help you get the idea even more. Here are a few examples of things that you could possibly use scraps of that would tell the story of your family history. *Scraps of clothing when a family member passes away that will remind you of them when you see it. *Scraps of baby blankets your children used when they were little. *Scraps of some of your favorite outfits that your children wore. *Scraps of a favorite handkerchief or scarf of a relative. *Scraps of fabric from old furniture or pillows you are throwing out, but are sentimental about. *Any combination of the above! The point is with this scrapbook page to tell a story. Maybe you want to do a layout of things that remind you of your grandmother after she passes away. Collect things around her house that might be going to goodwill, and keep a scrap of it. Create a beautiful, stitched patchwork layout with these scraps that will remind you of her. Include a picture of her on the page, and you will have a memento of her frozen in time with all the scraps of things that will make you think of her life. It will be something you will treasure for a long time to come!